A diamond select release. DST presents Marvel's number one street vigilante, The Punisher, in the Marvel Select line of highly detailed monthly figures created especially for collectors. 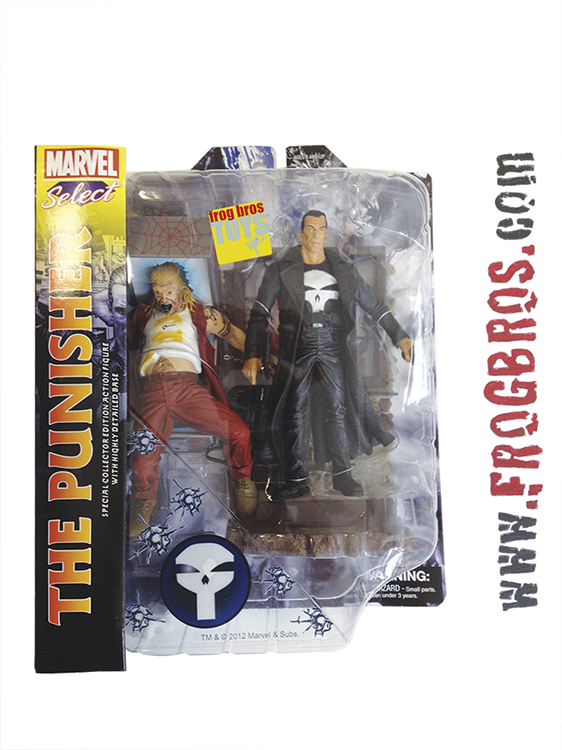 This figure was inspired by the now historic Punisher run by writer Garth Ennis that featured striking covers by Tim Bradstreet and brought The Punisher from back to the forefront of the Marvel Universe. Sculptor Steve Kiwus has captured every detail of Tim's art and the violence of Garth's stories. This figure comes complete with Spider-Man pinball machine, bar wall and tortured informant. In case you don't believe us, here is what cover artist Tim Bradstreet had to say, "All in all, a slick job by the good folks at Diamond Select Toys." Main figure is articulated and ships in deluxe blister card package. A diamond select release. Marvel's street vigilante. Inspired by artist Tim Bradstreet's interpretatino of the iconic character. Comes complete with spider-man pinball machine, bar wall and tortured informant. Deluxe packaging.